Beau Terre is French for “beautiful earth.” Known for our well-maintained and manicured campus in a park-like setting Beau Terre lives up to its name. We provide your business with a fresh and lively space to achieve your goals. Our campus is complete with many single level office park buildings that allow you and your employees easier access to workspaces. When you’re on a tight timeframe, every minute counts. Our single level buildings allow employees of all abilities to navigate in and out of the office easily. Breeze through your busy day of meetings and deadlines with an accessible workspace, perfect for the ambitious business professional. Visualize your office space at Beau Terre using our custom software to help you select colors, flooring, and more. Beau Terre Office Park offers convenience at every turn for your business. 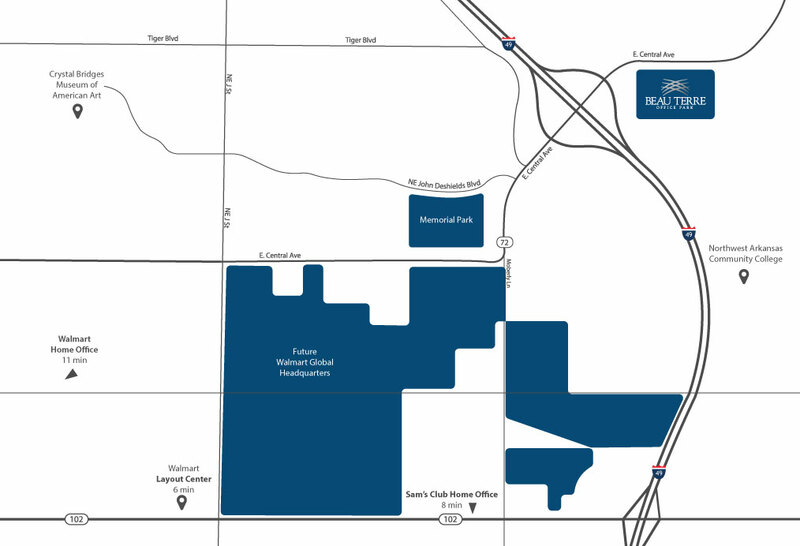 Our commercial park campus also provides tenants with expansive parking space and a prized location to call home. 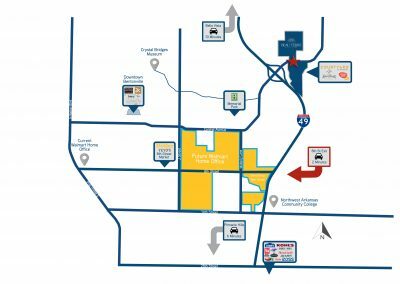 With our close proximity to the Walmart Home Office and I-49, your commute just got a whole lot more convenient. At Beau Terre, you can drive up to your office front door. With a prime office building location and convenience around every corner, Beau Terre keeps you in the center of it all. Reinvigorate your space and your business at Beau Terre Office Park. One-size-fits-all is not a phrase that applies to Beau Terre. We believe each business needs a space that works best for their employees and their budget. With multiple buildings, Beau Terre presents unique office layout options as well as a wide range of square footage availability. Fully customizable options are offered for the business that wants the individuality and branding of the company to translate into their office environment. Put your business in the best light with clients at Beau Terre. The stunning Beau Terre Office Park is conveniently located right off of East Central Avenue in Bentonville, Arkansas. Establishing your business at Beau Terre puts you in the middle of community businesses as well as supplier and vendor central. Your business is growing, and you need more space to accommodate that growth. Become a part of our community and our prime office space in a thriving business district. Beau Terre is perfect for your growing business to put down roots.